This could be seen as analogous to those who are more concerned with action against those who allegedly hacked the DNC email and released it to Wikileaks as opposed to what was revealed about the actions of the DNC in their email. In reading through the docments they released, I thought that their greater concern was more a matter of concern over potential security threats from discussing security procedures used by the FBI and Secret Service. First of all, it isn’t the FBI’s job to to tell journalists or private citizens they can’t take photographs of a former president and the Attorney General? What were the agents going to do, arrest people for taking a picture or video? Also, if there was nothing wrong with the meeting and it was totally innocent, why were the federal agents instructed to demand no one take a picture? It is also clear why Bill Clinton would want to keep this all a secret. The Clintons have been found to have unethically received payments from multiple parties with decisions before the State Department. This included both donations to the Clinton Foundation and unprecedented payments for speeches to Bill Clinton. 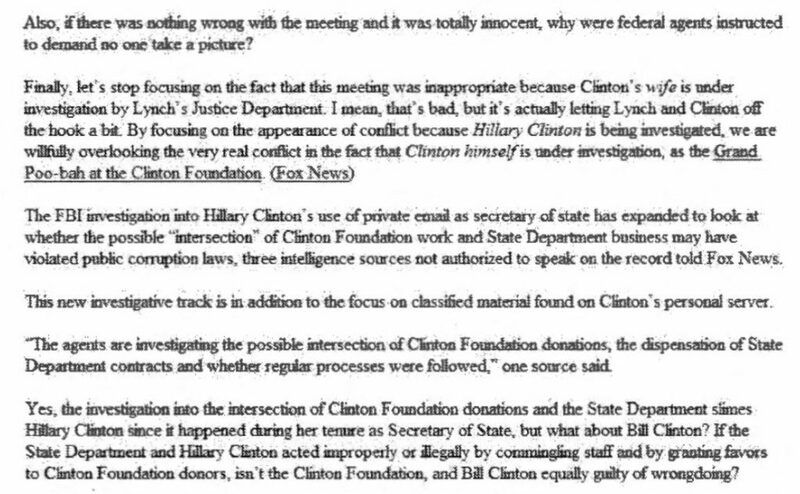 Hillary Clinton also ignored the ethics agreement she entered into before being confirmed as Secretary of State to disclose such contributions.